The other day my wife noticed one of our cats 'going crazy' at our living room window facing our backyard. She was surprised to see a small yellow bird sitting immediately on the other side of the glass, on a narrow ledge. The bird turned out to be an orange-crowned warbler (Vermivora celata), and a hot one at that. It was apparently looking for a shady spot to cool off, and this north-side ledge was perfect for a 10-15 minute break from the heat. This bird must have been particularly hot, as it was 'panting'. Birds don't sweat to cool off, but pant instead, kind of like a dog. It's actually a daily summer-time sight here in the low desert. If you're interested in the biology behind birds panting, do a quick google on 'birds gular panting', and you'll have some nice reading in front of you. 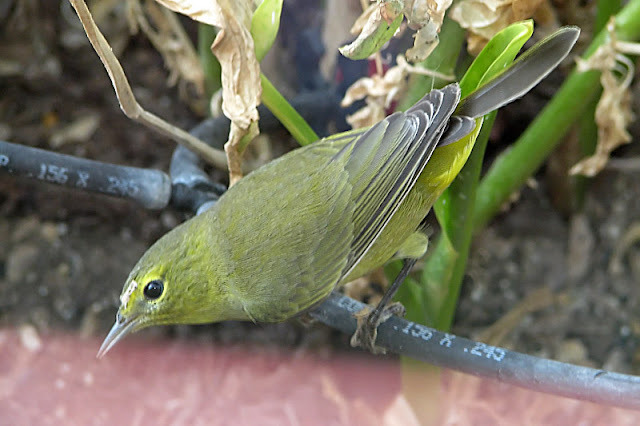 Anyway, this little event provided for some nice close-up looks at the Orange-crowned Warbler. 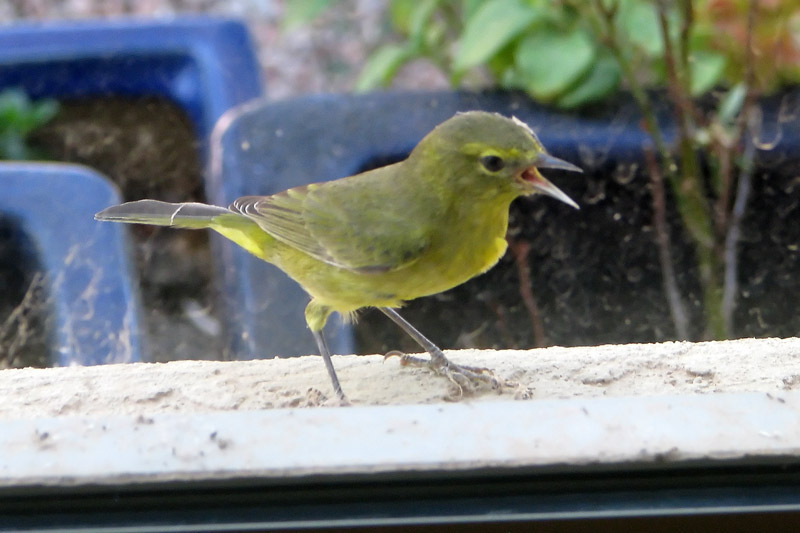 They are one of the more common warbler visitors here in Maricopa, and can be seen almost anytime during the year. Despite being somewhat common, I've never seen more than two or three in the yard at time, and it is not uncommon to occasionally go a few months with no sightings. Orange-crowned warblers are relatively easy to identify. They are generally a drab yellow (the one above was fairly bright - often they are duller). Like most warblers, they are very small and active birds, and have a typical warbler sharp and narrow bill. The eye-ring is a good place to confirm the identification. Orange-crowned have a light yellow eye-ring that is broken by a horizontal dark line, as can be seen in the photo above. The only typical low desert warblers that look similar are the Yellow Warbler, which is typically brighter and lacks the horizontal eye-line, and some first-year Common Yellowthroats and Wilsons Warblers, both of which can be distinguished from the Orange-crowned by either habitat or the eye ring/eye-line. There are some rare vagrant eastern warblers that may also look similar, but vagrant warblers tend to occur more often in fall and winter. I was really hoping to get a view of that elusive 'orange crown' on its head, but even with these close views it was not visible. Often, the orange crown feathers for which the bird is named is not visible except when the bird is bathing or if inspecting in-hand.